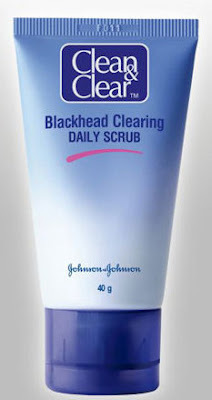 Clean & Clear Blackhead Clearing Daily Scrub. This Clean & Clear Daily scrub from Johnson & Johnson, claims to have visibly less blackheads in just 3 days. I have used many Clean & Clear Products since I have acne prone skin and its acne fighting products works wonders on my acne prone sensitive skin. But among all, my favorite are Clean & Clear Foaming Facial Wash & Clean and Clear Oil Free Moisturizer. Is Clean & Clear Blackhead Clearing Scrub good for sensitive skin? Is this scrub good for acne prone skin? Does it stands up to its claim? Read below to know all this. What Clean & Clear Daily Scrub Claims? Clean & Clear Blackhead Clearing Daily Scrub is a unique blend of micro-scrubbing beads works to break down trapped dirt, oil and dead skin cells that can cause blackheads. The natural apple extract formula penetrates deep down into the pores to help soften stubborn blackheads and prevent new ones from forming. Its gentle exfoliating action gives you visibly less blackheads in just 3 days for a clean, clear and beautiful skin. Since Clean & Clear range targets people suffering with acne & acne problems, they are my top most priority since I have acne prone sensitive skin, so is this Clean & Clear Scrub good for acne prone sensitive skin? Clean & Clear Daily Scrub comes in a very handy & hygienic tube with a flip top. Take a look below. The scrub is colorless & is of medium consistency with some gentle granules in it, which they call it as Micro Scrubbing Beads. On application, the scrub foams nicely, very little quantity is required to clean whole face. Right after the first application, one can see a visible difference in the skin appearance. Specially the nose area appears to be very clean immediately after 1st application . On using this Clean & Clear Scrub for 3 days, a noticeable difference is seen in skin appearance & blackheads. Skin appears to be much clear. Though this scrub is much gentle than other scrubs, so if you want a tough exfoliation for some stubborn blackhead like nose sides, this scrub wont work. I have really stubborn, difficult to remove blackheads on my nose area on which this scrub didn't work really well. This Clean and Clear Daily scrub can be used daily as the name suggests since it is very gentle even for sensitive skin like mine. Overall a good product for people suffering from frequent blackheads, since using this scrub daily will reduce their blackheads & also give them clear skin by exfoliating dull skin. This Clean & Clean scrub is good for people with acne prone skin, since its very gentle & can be used on sensitive skin too. Very hand , Travel Friendly & hygienic tube. Can make skin dry in some cases. Not much effective on stubborn blackheads. I've also found that Clean and Clear does a great job with the blackheads. Great review!